Pass Your Pennsylvania Motorcycle Driver's License Test with EASE! Are you in the process of getting your Pennsylvania motorcycle driver's license? If so, we can help you with that. Our Cheat Sheets will help you study more effectively so that you can pass your written test on the first try! All the resources you need are at your disposal. What are you waiting for? Get started today! In the State of Pennsylvania, you must possess a motorcycle learner's permit and pass a knowledge test and on-cycle exam before you can attain your Pennsylvania motorcycle 'driver's license. 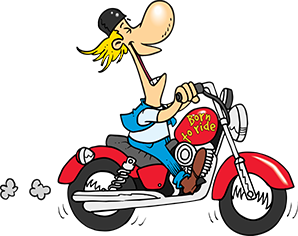 If you are under the age of 18, you are required to maintain a permit for at least 6 months and have completed 65 hours of supervised riding before you can take the on-cycle exam. The written exam is composed of multiple-choice questions gathered from the Pennsylvania Motorcycle Operator's Manual, and includes topics such as basic vehicle control, wearing the right gear, knowing your motorcycle, keeping your distance, and crash avoidance. Using our Cheat Sheets will ensure that you retain all the information you need to pass the written test on the very first try! Cheat! Take a Pennsylvania Motorcycle Driver's License Practice Test! 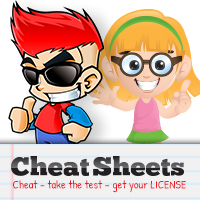 Our Cheat Sheets simplify everything for you so that you can be on your way to passing the test with confidence. They are thorough and easy to read; you can take them anywhere you go as they're compatible with your smartphone or tablet. Study them day or night, from the convenience of your home or during your lunch break. For even greater preparation, use a Pennsylvania motorcycle driver's license practice test. Our Cheat Sheets provide you with invaluable information so that you can be on your way to passing the test on you very first try!